Write a single sentence that is an interesting thesis then the next person should come along and write another sentence in which they compare and contrast these two items in terms of their iconography, form, and context. Both art are telling a story of the life after death, as One is from the Book of Death from Egypt while the other the Flying Banner from Lady Dai's tome from China. Gretchen Steinwandt Wilburn Both use hierarchic scale to tell you what people of piece are the most important (or the least important). We have five little dudes serving big lady Dai on her dais. The ones that aren't kneeling are at least a head shorter than she is and she is in the middle. We also have four mini wives(?) hanging out on the lotus blossom. None of these people are actually important, except to service the person the piece is venerating. We know this because they are smaller in hierarchic scale. 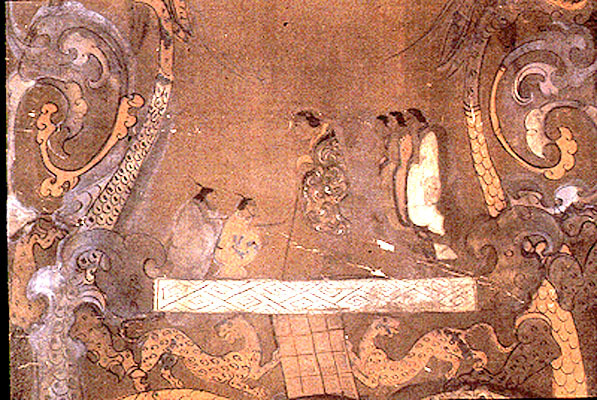 The word 'balance' are both present in both art work, as the Bi Disk from the Flying Banner held the meaning of balance in China as also gathering in Qi / Yin&Yan, along with the Raven and the Toad on the top of the Flying Banner can be represent as F/M in China Mythical stories, while in Egypt had the scale in the middle of the art to say weighting out the heart to see one's heart had done good or not. When I personally look at the art that defies the after life between Egypt and China I see different levels of the after life. China and Egypt also share the similarities of having some mythical creatures. China with the Dragon and Egypt with Anubis and it's hound (that eats hearts once balanced). Of course Egypt has many other, but that's only part of what I see. 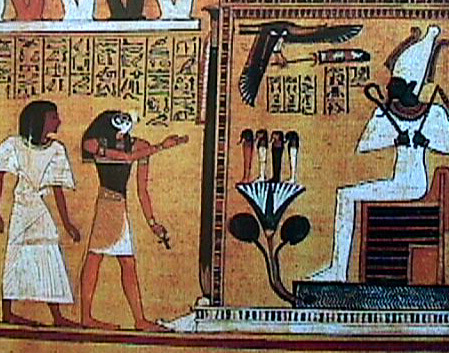 The characters that represent the souls as well as the spirits are somewhat in a side profile view. Both of these painting are talking about a journey of after life. The one on the top is Lady Dai's banner. It is made of silk.The patterns and shapes are symmetrical. It is showing dragons. In ancient Chinese culture, the dragon is meaning a high power,only high leader or emperor can wearing these kind of symbols banner, and dragon is flying in the sky, which means a better life will be on the top of de sky. So, this is showing after Dai died, she will go to a better place and to be a higher level god. The The bottom one is also showing how to get a better life after death. 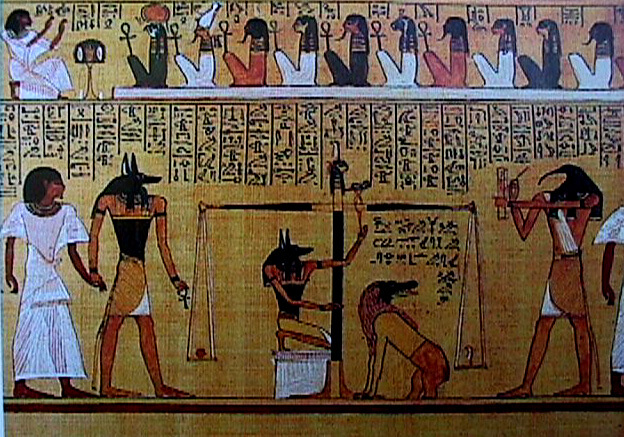 In Egyptian ancient Culture, Anu,I can see how Anubic is holding a heart, and this heart is equal a feather,The feather is very light, it is easy to flow to the sky.I think the meaning of Last Judgement of Hu Nefer is the same as Lady Dai's Banner that a better life after death.